SHARE News>> Colin Mcrae’s Prodrive Wrc Gc8 For Sale! Imagine owning this car! Dan Hsu from Japanese Nostalgic Car Magazine sent me a link to this story on Autofiends, announcing that the very first WRC Subaru Impreza rally car built by Prodrive has been put up for sale recently. This GC8 has apparently been restored by McKinstry Motorsports in Ireland, and has been refinished in the same Rally Finland livery (no pun intended. Well, you caught me. It was sort of intended) that it debuted with in 1997. This WRC Impreza is being sold by Prodrive themselves for only $123,000. I think that is ridiculously cheap for a historic WRC GC8 rally car, but especially so when it was the very first Prodrive GC8 ever built, and it was driven my Colin McRae himself! (RIP Colin McRae) And if that doesn't sound legit enough for you, check out the car's serial number: PRO-WRC-97-01. Imagine actually owning this car; a piece of WRC and Subaru history. Come to think about it, Subaru should buy this car themselves so they can preserve it in a museum somewhere, along with the first Team Orange drifting WRX, which won the D1GP Series Championship. Just think… some rich Subaru enthusiast somewhere could end up dropping cash on this GC8. If I were to buy this car, I would try to get the trunk signed by all the members of the original Prodrive WRC team, and especially Nicky Grist. What do you think, Subie lovers? I know someone out there must have the money for this car, and is planning on some major pwnage at the next Subaru meet. Sort of a cool uncommon fact: The front fascia of the 22B STi (pictured above of course), was actually designed by none other than Gordon Murray who is the man behind the McLaren F1! At the time he was trying a bit of back road rally driving himself and I don't know how he got involved with the 22B specifically but obviously when Gordon Murray offers to develop a part of your car you let him in the door. Sorry for the double post I just also wanted to add that contrary to popular belief Bunta's STi from Fourth Stage is in fact an GC8 STi Type V with a 22B front fascia, not a complete and original 22B. "I think that is ridiculously cheap for a historic WRC GC8 rally car, but especially so when it was the very first Prodrive GC8 ever built, and it was driven my Colin McRae himself! 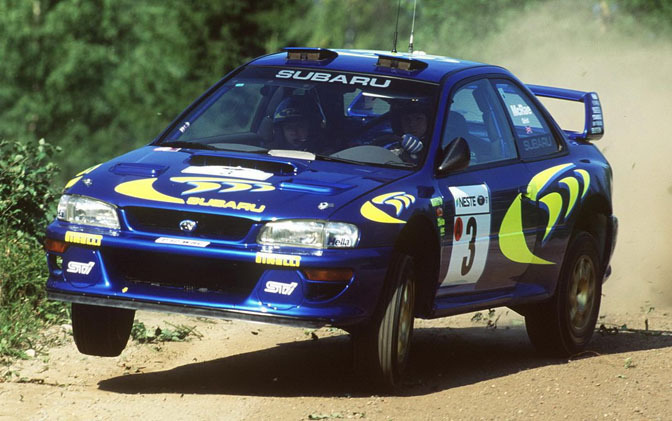 (RIP Colin McRae) And if that doesn't sound legit enough for you, check out the car's serial number: PRO-WRC-97-01." its not the first gc8 built by prodrive, its the first WRC titled prodrive car, since before all the gc8s were group A's. The first prodrive gc8 was 1993. Yea that is kinda cheap, for something with so much history. "...along with the first Team Orange drifting WRX, which won the D1GP Series Championship." F3INT - I'm pretty sure you meant Peter Stevens, the guy who styled the F1 Peter has done quite a bit of work for Prodrive and also did the fender flares. I don't ever recall Gordon being involved. I can't find it on the prodrive site anymore; probably sold in a ny minute at that price. that car belongs to a museum! Yea, it's the optional 22b replica bumper from STi. Bunta's car used a bumper subaru sold for a limited amount of time...a narrow version of the 22B design. I've got a customer in NJ we got one for many years ago.